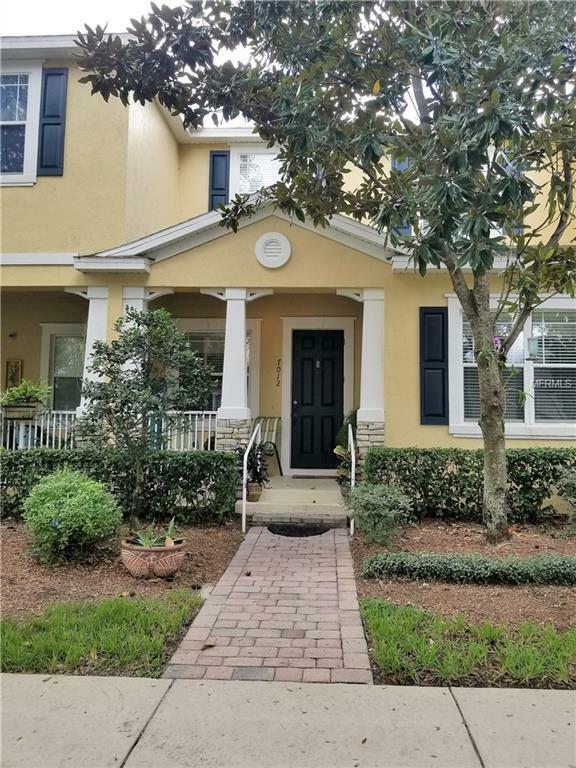 Why wait to build when you can purchase this beautiful move-in ready townhouse located in the highly desirable Preston Square community. This well maintained townhouse comes complete with a spacious loft/gameroom/bonus room. Master bedroom, located on the main floor includes a tray ceiling and 2 closets. Master bathroom comes complete with granite counter, dual sinks, vanity, separate garden tub and spacious shower. Two additional bedrooms with a full size bathroom are located upstairs with the loft. Full sized laundry room is located on the main floor. 2 car rear entry garage, and extra parking space in common area. Community pool and playground are just across the street. This beautiful walled in community offers tree lined streets, playground, park and swimming pool. Dog walking stations make it easy to walk and clean up after your pet. Ideal for full time owners, second home, or vacation villa. Close to Disney, easy access to 535, plus plenty of shopping and restaurants! Listing provided courtesy of 1st Class Waterfront Properties Llc.